Decoratively Stitched replacement zip tag handbags. 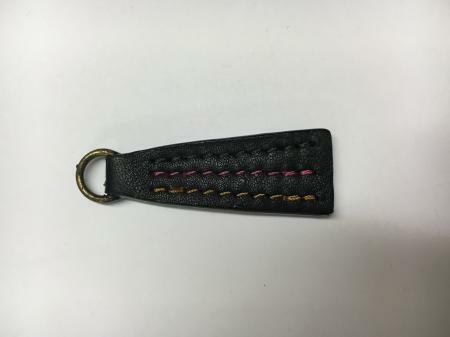 This leather replacement zip tag by is decorated with large running stitches of embroidery thread in pastel shades. It comes with a nickel split dee ring and is edged in the matching shade to the main part of the tag which is cream in both cases. The leather portion of this tag measures 4.7cm in length. The tag is available in black with; orange, green and shocking pink stitching only.